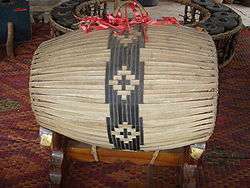 Barrel drums are a class of membranophone, or drum, characterized by a barrel-shape with a bulge in the middle. They are often one-headed and open at the bottom. Examples include the Vietnamese trong chau and the bendre of the Mossi of Burkina Faso. This article is issued from Wikipedia - version of the 3/11/2014. The text is available under the Creative Commons Attribution/Share Alike but additional terms may apply for the media files.